The improbable and charming love story of a girl who did not know her place and a man with no place of his own. Margery Sharp wrote her novel Cluny Brown, set in the time prior to the outbreak of WW2, while working for the war effort as an Army Educator. It is just one of her many novels that were adapted for the screen from The Nutmeg Tree aka Julia Misbehaves to The Rescuers. The screenplay is by Samuel Hoffenstein and Elizabeth Reinhardt (Laura), with contributions from James Hilton (Random Harvest). This movie is the happy recipient of The Lubitsch Touch, being the final completed project of the great director prior to his death at the young age of 55 from a heart attack. Cluny Brown: "I may not cook the best tripe and onions in England, but whoever gets me won't have to worry about his plumbing." 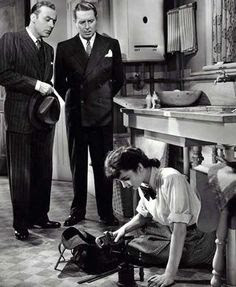 On a lazy Sunday afternoon in the London of 1938 Adam Belinski (Charles Boyer), a Czech refugee, wanders into the home of Hilary Ames (Reginald Gardiner), about to host a cocktail party and beset with an unco-operative sink. Belinski intended on putting the touch on his friend, the lettor of the flat. He manages to wrangle a small stipend, a nap, and the acquaintance of Cluny Brown (Jennifer Jones). Cluny feels she may have found her place in the world as a plumber. She has observed her Uncle Arn (Billy Bevan) and felt she could do him one better. Belinski also becomes the unbidden object of the adoration and charitable impulses of two rich young men with serious attitudes toward Nazis and Czech refugees, Andrew Carmel (Peter Lawford) and John Frewen (Michael Dyne). Both men are pining over the cream of society, Betty Cream (Helen Walker). These disparate characters and their varying intentions will come together in the countryside. Cluny's Uncle Arn feels he has found a place for Cluny when he settles her in the position of a second maid at the Carmel Estate. Andrew Carmel feels he is successfully keeping Belinski safe from Nazis by installing him as a guest at the family country home. Cluny finally feels she has found a place when she attracts the attention of eligible village bachelor, the chemist Mr. Wilson (Richard Hadyn). Of course the relationship is dependent upon Cluny gaining the approval of his mother, Mrs. Wilson (Una O'Connor). What could possibly go wrong, or right? All of the supporting cast is superb. Sir Henry and Lady Carmel are played with fey appeal by Reginald Owen and Margaret Bannerman. The Carmel's butler Syrette and housekeeper Mrs. Maile display the proper haughtiness of their exalted positions, as portrayed by Ernest Cossart and Sara Algood. Cluny Brown is a whimsical and insightful look at the class system and the rules society places on ourselves as to behavior. The observations and social commentary are smart and indulgent. The characters are silly and real. The romances we follow with interest are affecting and sweet. 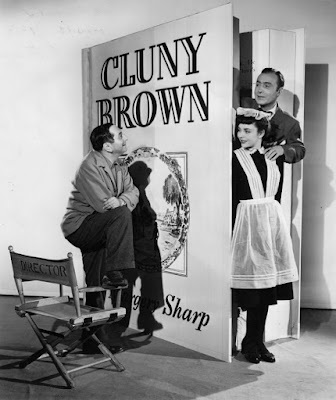 Cluny Brown is a completely winning character, and a charming movie. Jennifer Jones is TCM's September Star of the Month. If, like myself, it took you until 1953s Beat the Devil to appreciate the actress' comedic abilities, then you will truly enjoy Cluny Brown. It pops up on the TCM broadcast schedule on Tuesday, September 5th at 1:00 in the morning. I've seen many of Jennifer Jones films and have a hard time appreciating her. But she is so unaffected and charming in Cluny Brown that I couldn't help but love her. Often it takes that one special role that makes us see an actor in a different light. It's lovely when that comes together. I must have learned about this in the Lubitsch bio I read, but I guess I failed to realize that Cluny is a girl's name... not that I've met many people named Cluny. Cluny is an unusual name, but it suits her. She's an unusual girl. Oh. I thought perhaps you were about to tell Igor to throw the switch or something. Like the new template. Will miss the typewriter. Oh, that would be fun. I always wanted to tell Igor to throw the switch. Thanks. Janet's working on tidying up the Caftan Woman pic. I'll have to find a place for the typewriter. This is one I continuously miss! I believe you noted on FB that it was going to be on, and I still missed it! Your time is now! Tuesday at 1:00 am. Set that recorder. Stay awake if you have to. You will not miss it again. One of Jennifer's best movies--so glad you highlighted it. It's funny...I resisted watching it as a kid because of the title! I can understand that childish resistance because of the title. It's not a common name and it doesn't really tell you anything. I'd avoid it as well, and go looking for a western. Also, I LOVE the new design of your blog and that photo of you. 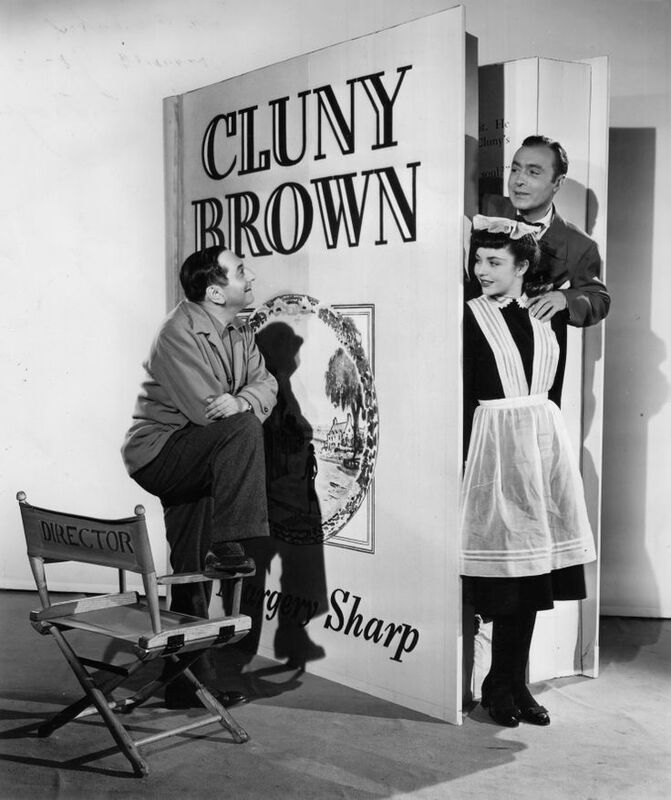 I'm so excited about Cluny Brown being shown tonight, and the idea that it will be getting more fans. I know it will tickle your funny bone and touch your heart. Thank you so much. I was overwhelmed by that "first day of school" feeling and since I don't need a new schoolbag, it was time to redecorate the blog. My daughter helped with the new banner. It's so nice to have an in-house animator. This sounds like a real gem! I've seen countless Jennifer Jones films but, even after seeing so many, I'm not particularly fond of her.....nevertheless, I love her choice of films ( she knew how to pick 'em ) and Cluny Brown sounds right up my alley. Thanks for spotlighting it, CW! P.S : What a cast! Cluny Brown has an undeniable charm for me, and I hope it will prove so for you. Sometimes one role will turn around your feeling about an actor.